She-Hulk # 161 Review – AiPT! Jennifer Walters begins her journey to freeing herself. The exploration of self has always been an important part of The Hulk’s story, whether it be Bruce Banner, Amadeus Cho, or Jennifer Walters. Who is the real person? Is the rage monster the truth, or is the human? For Jennifer Walters, since the death of her cousin, the answer has been much less clear than in the past. Being forced to fight to the death with a manipulated fan by The Leader puts the idea of true control and true self front and center. Robyn Meiser Malt has, under the hypnotic influence of The Leader, taken a transfusion of Jennifer Walters’ blood, hoping to steal the power of The Hulk from the woman she sees as unworthy of the power. The super-foreheaded Leader has other plans, of course. Robyn transforms into a deformed, hyper-aggressive Hulk form more akin to the Abomination than any actual Hulk. An order from The Leader sends her raging into an arena to kill Jennifer. 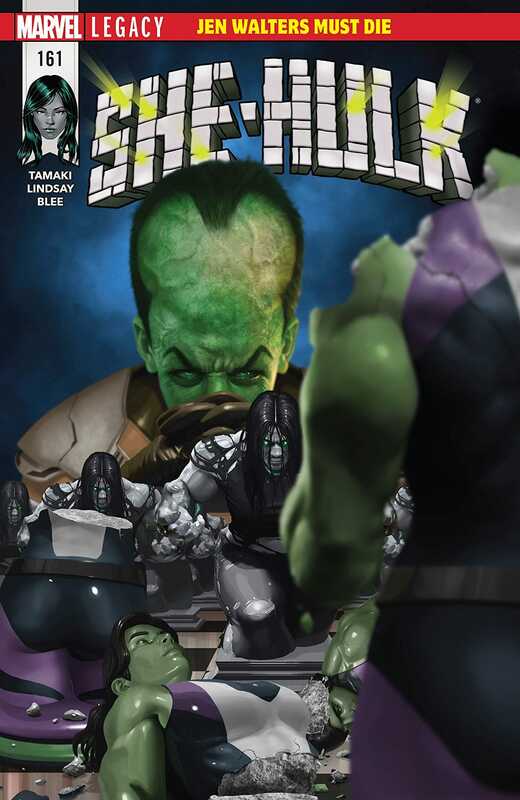 While Jennifer resists as long as possible, her transformation into the gray Hulk is inevitable, as is, most likely, her defeating and killing Robyn, fulfilling The Leader’s Plan B by destroying Jennifer Walters as a person by forcing her uncontrollable side to murder an innocent. Writer Mariko Tamaki and artist Jahnoy Lindsay put together an excellent scene inside the psyches of Jennifer and Robyn as their bodies battle. Robyn has resigned herself to her fate, blaming herself for The Leader’s influence. Jennifer wants to fight the rage that has been inside her all these months and save Robyn’s life. While I won’t spoil the ending of the fight (it’s pretty badass), I will say that The Leader is an unironic classic villain, spouting lines like “This will be your undoing.” Vintage Leader. In the end, Jennifer Walters comes to a realization that, to be honest, she should have had months ago. In order to escape the rage inside her, she has to deal with it directly, right at the source. Since the death of Bruce Banner at the hands of Hawkeye, only one person has offered Jennifer that solution. Could this be the actual end of She-Hulk? Find out next time inside the unconscious mind of Jennifer Walters. The Leader is an unironic classic villain, spouting lines like "This will be your undoing." Vintage Leader. In the end, Jennifer Walters comes to a realization that, to be honest, she should have had months ago. I still don't know why this series is ending.